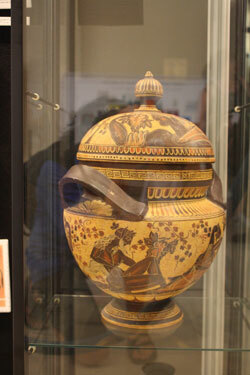 The first Greek pottery can be traced back to the early Neolithic period around 6500-5200 BC. With the discovery of agriculture, the “modern” man abandoned his previous nomadic existence to a sedentary way of life. In the hands of the Neolithic man, clay with the help of fire, was transformed into a variety of vases and vessels used for cooking and storing grains. The greatest concentration of Neolithic settlement in Greece can be found in the Plain of Thessaly. The two most important areas being Sesklo and Dimini. During the ensuing Bronze and Iron ,Ages, man got familiar with the sea, progress was made in navigation which explains the transmarine expansion of the pottery Made by the Minoans and the Myceneans. The geometric style appears between 900-720 BC with decorations mad mostly of meanders and heckers covering the entire pot. During that period Homer wrote the Iliad and Odyssey and the Olympic Games commenced to honour Zeus, the father of all gods. In the 7th and 6th centuries BC, Corinth was the innovator of pottery decoration and dominated pottery exportation. By the middle of the 6th century it was surpassed by the school of Athens with their black-figure vases painted by such famous artist as Exekias and Sophilos. The decorations will be reversed a hundred years later with red-figure vases. Douris,Sotadis,Euphronious,and Nicosthenos are masters of that period. It is the classic Period, the “golden age of Greece”. Democracy was born under Perikles , the Partheno was build on the Acropolis by phydias, Socrates and Plato founded Philosophie, Sophocles, Aeshylos and Eyripides created tragedies. The painting on vases declined at the end of the 4th century BC. After the death of Alexander the Great, the greatest military man of all times, his Empire fell into Roman hands. Today, Greek vases are considered universal treasures and can be admired in the worll;s greatest museums.. Also their influence on archeological studies and research continues to be significant.